Axes are tools used to ease the process of collecting wood and other wooden objects, but are not required to gather them. Wooden axes with full durability can be found in 52.2% of bonus chest in stacks of 1 with full durability. Stone axes with 20-50 damage can be found in 52.2% of bonus chests in stacks of 1. Stone axes with 50-100 damage can be found in 21.8% of loot chests in stacks of 1. Axes are crafted using three tool materials and two sticks. Two axes of the same material can be combined in the crafting grid to combine their durability. This can also be done through use of the anvil, to preserve enchantments. 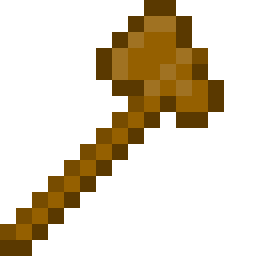 The axe is used to mine wood and wooden based blocks faster. It is not required to collect the blocks, like the pickaxe is for stone related blocks. Compared to the axe, breaking these things by hand is still pretty quick. There are five types of axes, each with different mining speeds and durability. Wooden planks 60 Easiest axe to craft, however also the slowest. Can be found in the bonus chest and loot chest. Cobblestone 130 Second easiest to craft, and slightly faster than the wooden axe. Can also be found in the bonus chest and loot chest. Iron ingot 251 Slightly harder to craft, however quite fast. Gold ingot 33 Fastest mining speed, however it is not recommended for regular use as it has very low durability, so it uses up a lot of gold quickly. Diamond 1500 Faster mining speed than the iron axe, however slightly slower than gold. It has a lot of durability for how much it costs. Axes can be used to deal more damage to mobs than by hand, however an axe does half a heart less damage than a sword of the same material, and uses up two durability points when used to deal damage to mobs. This makes them a less used weapon than swords because they are crafted with three tool materials as opposed to two, however they do less damage and do not last as long, making the sword the better option. Axes can be enchanted directly through the enchantment table. Different axes have different item ids. Item data is used to determine the durability of the axe. If using the /give command, this can be specified using the third parameter. Positive integers are how much durability the axe has taken away from full durability, and negative integers are how much durability the axe has left. For example, the command /give wooden_axe 1 10 gives one wooden axe with ten durability taken away from full durability. This page was last edited on 22 February 2019, at 06:44.